Allium is a genus of monocotyledonous flowering plants that includes hundreds of species, including the cultivated onion, garlic, scallion, shallot, leek, and chives. The generic name Allium is the Latin word for garlic, and the type species for the genus is Allium sativum which means "cultivated garlic". Linnaeus first described the genus Allium in 1753. Some sources refer to Greek αλεω (aleo, to avoid) by reason of the smell of garlic. Various Allium have been cultivated from the earliest times, and about a dozen species are economically important as crops, or garden vegetables, and an increasing number of species are important as ornamental plants. The decision to include a species in the genus Allium is taxonomically difficult, and species boundaries are unclear. Estimates of the number of species are as low as 260, and as high as 979. Plants of the genus Allium produce chemical compounds, mostly derived from cysteine sulfoxides, that give them a characteristic onion, or garlic, taste and odor. Many are used as food plants, though not all members of the genus are equally flavorful. In most cases, both bulb and leaves are edible. The cooking and consumption of parts of the plants is due to the large variety of textures, and flavours, which may be strong or weak, that they can impart to the dish they are used in. The characteristic Allium flavor depends on the sulfate content of the soil the plant grows in. In the rare occurrence of sulfur-free growth conditions, all Allium species completely lose their usual pungency. The genus Allium (alliums) is characterised by herbaceous geophyte perennials with true bulbs, some of which are borne on rhizomes and an onion or garlic odor and flavor. 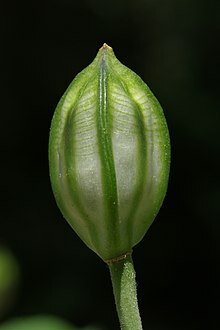 The bulbs are solitary or clustered and tunicate and the plants are perennialized by the bulbs reforming annually from the base of the old bulbs, or are produced on the ends of rhizomes or, in a few species, at the ends of stolons. A small number of species have tuberous roots. The bulbs' outer coats are commonly brown or grey, with a smooth texture, and are fibrous, or with cellular reticulation. The inner coats of the bulbs are membranous. The flowers, which are produced on scapes are erect or in some species pendent, having six petal-like tepals produced in two whorls. The flowers have one style and six epipetalous stamens; the anthers and pollen can vary in color depending on the species. The ovaries are superior, and three-lobed with three locules. Subsequent molecular phylogenetic studies have shown the 2006 classification is a considerable improvement over previous classifications, but some of its subgenera and sections are probably not monophyletic. Meanwhile, the number of new species continued to increase, reaching 800 by 2009, and the pace of discovery has not decreased. Detailed studies have focused on a number of subgenera, including Amerallium. Amerallium is strongly supported as monophyletic. Subgenus Melanocrommyum has also been the subject of considerable study (see below), while work on subgenus Allium has focussed on section Allium, including Allium ampeloprasum, although sampling was not sufficient to test the monophyly of the section. Nearly all the species in this lineage of five subgenera are accounted for by subgenus Melanocrommyum, which is most closely associated with subgenera Vvedenskya and Porphyroprason, phylogenetically. These three genera are late-branching whereas the remaining two subgenera, Caloscordum and Anguinum, are early branching. The third evolutionary line contains the greatest number of sections (seven), and also the largest subgenus of the genus Allium: subgenus Allium, which includes the type species of the genus, Allium sativum. This subgenus also contains the majority of the species in its lineage. Within the lineage, the phylogeny is complex. Two small subgenera, Butomissa and Cyathophora form a sister clade to the remaining five subgenera, with Butomissa as the first branching group. Amongst the remaining five subgenera, Rhizirideum forms a medium-sized subgenus that is the sister to the other four, larger, subgenera. This line may not be monophyletic. The majority of Allium species are native to the Northern Hemisphere, being spread throughout the holarctic region, from dry subtropics to the boreal zone, predominantly in Asia. Of the latter, 138 species occur in China, about a sixth of all Allium species, representing five subgenera. A few species are native to Africa and Central and South America. A single known exception, Allium dregeanum occurs in the Southern Hemisphere (South Africa). There are two centres of diversity, a major one from the Mediterranean Basin to Central Asia and Pakistan, while a minor one is found in western North America. The genus is especially diverse in the eastern Mediterranean. The genus Allium has very large variation between species in their genome size that is not accompanied by changes in ploidy level. This remarkable variation was noted in the discussion of the evolution of junk DNA and resulted in the Onion Test, a "reality check for anyone who thinks they have come up with a universal function for junk DNA" Genome sizes vary between 7.5 Gb in A. schoenoprasum and 30.9 Gb in A. ursinum, both of which are diploid. Many Allium species and hybrids are cultivated as ornamentals. These include A. cristophii and A. giganteum, which are used as border plants for their ornamental flowers, and their "architectural" qualities. Several hybrids have been bred, or selected, with rich purple flowers. A. hollandicum 'Purple Sensation' is one of the most popular and has been given an Award of Garden Merit (H4). These ornamental onions produce spherical umbels on single stalks in spring and summer, in a wide variety of sizes and colours, ranging from white (Allium 'Mont Blanc'), blue (A. caeruleum), to yellow (A. flavum) and purple (A. giganteum). By contrast, other species (such as invasive A. triquetrum and A. ursinum) can become troublesome garden weeds. ^ "1793 illustration from William Woodville: "Medical botany", London, James Phillips, 1793, Vol. 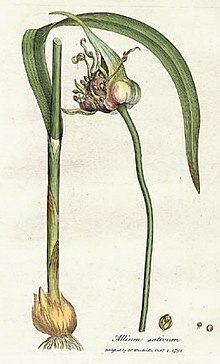 3, Plate 168: Allium sativum (Garlic). Hand-coloured engraving". Archived from the original on 2011-02-17. Retrieved 2015-04-07. ^ a b c d e f g h i Eric Block (2010). Garlic and Other Alliums: The Lore and the Science. Royal Society of Chemistry. ISBN 978-0-85404-190-9. ^ a b c Dilys Davies (1992). Alliums: The Ornamental Onions. Timber Press. ISBN 978-0-88192-241-7. ^ Chase, M.W. ; Reveal, J.L. & Fay, M.F. (2009). "A subfamilial classification for the expanded asparagalean families Amaryllidaceae, Asparagaceae and Xanthorrhoeaceae". Botanical Journal of the Linnean Society. 161 (2): 132–136. doi:10.1111/j.1095-8339.2009.00999.x. ^ Wheeler et al 2013. ^ a b "Allium in Flora of China @". Efloras.org. Retrieved 2012-12-11. ^ "Allium in Flora of North America @". Efloras.org. Retrieved 2012-12-11. ^ Peterson, R.P. 1982. A Field Guide to Edible Wild Plants: Eastern and central North America. Houghton Mifflin, Boston. ^ Gibbons, E. 1962. Stalking the wild asparagus. David McKay, New York. ^ a b c d Deniz et al 2015. ^ a b c d e f g h i j k l m n Li et al. 2010. ^ Friesen et al 2000. ^ von Berg et al 1996. ^ a b c Friesen, Fritsch & Blattner 2006. ^ Fritsch et al 2010. ^ Nguyen et al 2008. ^ Hirschegger et al 2010. ^ a b Ricroch, A; Yockteng, R; Brown, S C; Nadot, S (2005). "Evolution of genome size across some cultivated Allium species". Genome. 48 (3): 511–520. doi:10.1139/g05-017. ISSN 0831-2796. ^ Freeling, Michael; Xu, Jie; Woodhouse, Margaret; Lisch, Damon (2015). "A Solution to the C-Value Paradox and the Function of Junk DNA: The Genome Balance Hypothesis". Molecular Plant. 8 (6): 899–910. doi:10.1016/j.molp.2015.02.009. ^ Gualtiero Simonetti (1990). Stanley Schuler (ed.). Simon & Schuster's Guide to Herbs and Spices. Simon & Schuster, Inc. ISBN 978-0-671-73489-3. ^ "RHS Plantfinder - Allium 'Ambassador'". Royal Horticultural Society. 2016. Retrieved 5 January 2018. ^ "RHS Plantfinder - Allium 'Beau Regard'". Royal Horticultural Society. 1995. Retrieved 5 January 2018. ^ "RHS Plantfinder - Allium 'Gladiator'". Royal Horticultural Society. 1995. Retrieved 5 January 2018. ^ "RHS Plantfinder - Allium 'Globemaster'". Royal Horticultural Society. 1995. Retrieved 5 January 2018. ^ "RHS Plantfinder - Allium 'Round and Purple'". Royal Horticultural Society. 2016. Retrieved 5 January 2018. Friesen, N; Fritsch, RM; Blattner, Frank R (2006). "Phylogeny and new intrageneric classification of Allium (Alliaceae) based on nuclear ribosomal DNA ITS sequences". Aliso. 22: 372–395. Retrieved 13 October 2015. Nguyen, Nhu H.; Driscoll, Heather E.; Specht, Chelsea D. (2008). "A molecular phylogeny of the wild onions (Allium; Alliaceae) with a focus on the western North American center of diversity". Molecular Phylogenetics and Evolution. 47 (3): 1157–1172. doi:10.1016/j.ympev.2007.12.006. PMID 18226928. "Allium". World Checklist of Selected Plant Families. Royal Botanic Gardens, Kew. Retrieved 9 January 2017.